Have you ever wondered what the circumstances would be if Mary and Joseph were Nigerians? What would have happened in their village when the news broke that she was expecting a child without being with a man? It will no doubt be a scandal. A True Christmas Story gives an account of how Mary met Joseph, their respective social, economic and family situations, chronicling the events leading up to immaculate conceptions and the events that folded when pregnancy news broke. The play is set in our contemporary African setting and exploring themes of love, commitment, devotion and communality. Davidhouse Multimedia Limited promoters of the Live Theatre on Sunday have harnessed the scenario and will debut “A True Christmas Story” a hilarious musical play based on the Nativity story. Federal Palace Hotel, Ahmadu Bello Way, Lagos. Tickets available online at NaijaTicketshop.com, LOCUS Promotion and Terra Kulture on Tiamiyu Savage Street, Victoria Island. Everyone loves a great show, and this is what MISTRESS OF WHOLESOME is! What will you do if your husband’s mistress showed up at your door, to ask for an odd “favor” ? 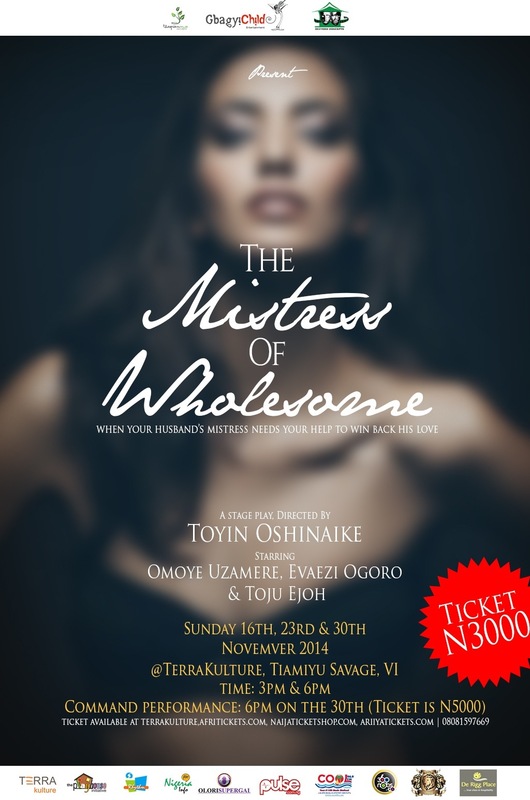 In this play, Moji ‘the mistress’ surprises Adesuwa, ‘the wife’ of Lakunle in their home and holds her hostage. According to Moji, Lakunle has now fallen back in love with Adesuwa, as the couple has gotten closer in their efforts to adopt a baby. Moji is naturally ‘very put out’ by this and wants Adesuwa to convince Lakunle to fall back in love with his mistress so that things can be the same as they were for the past few years. Adesuwa, who is desperate for a baby sees Lakunle playing ‘the good and attentive husband’ as the only way that she will ever manage to adopt a child and naturally refuses. Things get even more complicated in this comic stage play when a gentleman from the adoption agency arrives to interview Lakunle and Adesuwa and to screen them as potential parents. When it turns out that Lakunle is actually locked in the trunk of Moji’s car across town, the two women must act fast to salvage a situation that is going downhill at a rate of knots! Dates: November 23 & 30, 2014. 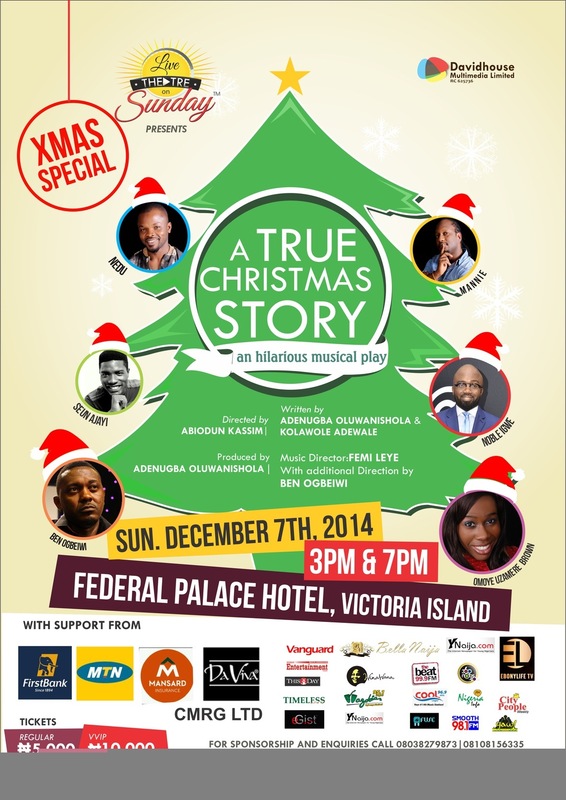 Venue: Terra Kulture, Plot 1376 Tiamiyu Savage Street, Victoria Island, Lagos. MISTRESS OF WHOLESOME is directed by veteran stage actor, Toyin Oshinaike, and will be starring media/entertainment heavyweights, Omoye ‘Brownie’ Uzamere, Evaezi Ogoro, and Toju Ejoh.